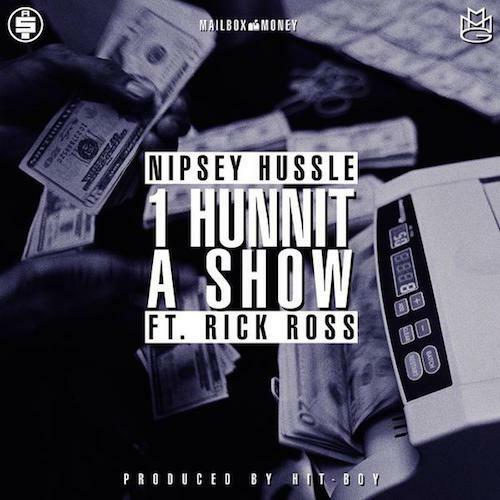 Nipsey Hussle links up with Ricky Rozay for "1 Hunnit A Show". After hitting us with “50 Niggaz” last week, Nipsey Hussle decides to return with another new joint for the fans tonight titled “1 Hunnit A Show” featuring the bawse Rick Ross. As the title depicts, the record finds both Quan and Rozay jumping on this Hit-Boy produced banger and boasting about all the paper they stack after their shows. It serves as the newest leak off Nipsey’s upcoming project, Mailbox Money, which is dropping later this month. Take a close listen and let us know what ya think! Is it a hit or naw?